Finally. . . our Victorian Living Room! Whew, it has been a big and busy year for the Berthels. 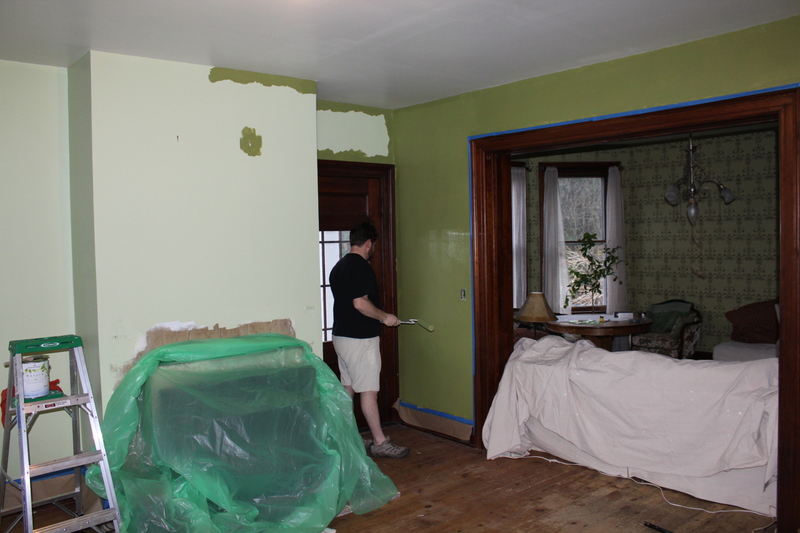 We moved back into the living room this weekend, after putting on the sixth and final coat of ceiling paint. Yeah, six. Well, you heard about it being too glossy. Then, we needed to put on 3 coats of matte to get it just right. I can’t say I’m completely pleased, as I am a precise and finicky painter, but it is livable. We cleaned the woodwork, scoured the floor, touched up the walls and moved back in. I still need to oil the woodwork and Bill is finishing the mantel detail, but we moved in. And, we need to hang the light. I think we’re both worn out, though, frankly. 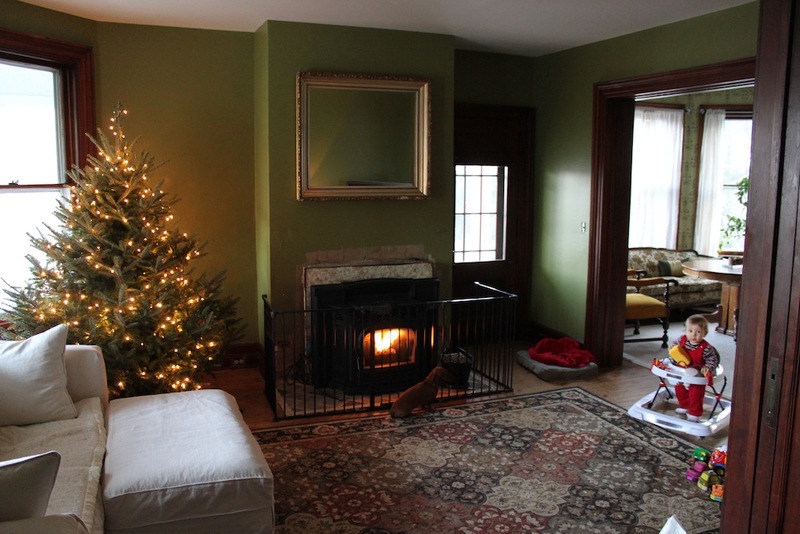 To recap 2011, we opened the year with a full pregnancy on my part and Bill hurriedly moving through the floor in the master bedroom so that we could have a place to settle the baby. We spent the first four months living in the guest room and downstairs because the smell of those floors was so strong. The newborn took all of our energy and time, and yet, we began putting up sheetrock. AND while we were living in the rest of the house, we began re-plastering the nursery, in anticipation that our little one would be moving in there by late spring. Well, as most things go, that took us a while and it was late summer before Will lived in his room. SO, while that room became livable, we tore apart the living room, in hopes that we could plaster and paint and be done by the holidays. It is the holidays, so we had to move in. We decided to fore go refinishing the rest of the floors, until we could find the product we liked and the time opened up for us to do the work without sacrificing Will’s lungs or our sanity. As of yet, we don’t know when that process will be complete, but I can say that we’re feeling the need to rest and work on the details. With so many tidbits to finish up, I don’t know when we’ll begin the next big project. Right now, we have two bedrooms to refinish, one bath to redo, one laundry room, a garage to paint, floors all over to refinish and all of the hallways to rework. There is a lot left to do. . . but a lot more time to do it. Right now, we are going to enjoy our little guy and complete the little things we have going on. I have lots of painting to keep me busy and Bill will share his woodworking as it progresses. In the meantime, enjoy your holidays. And write when you get a chance, we love hearing from you. I absolutely love it! Really beautiful. You guys are amazing. Previous Previous post: Is the painting finished yet?